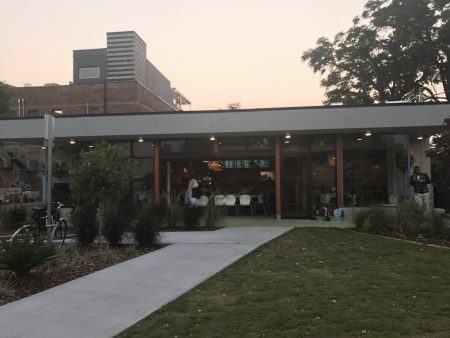 Five Points’ newest addition, The Bread & Board, opened their doors on April 12th to much fanfare and expectation. The concept seems simple—an artisanal sandwich shop with a menu composed of house smoked and cured meats with cheeses assembled into a few sandwiches or deconstructed onto boards for sharing served with house-made rosemary focaccia rolls. The boards have a larger portion size than the sandwiches and are priced a bit higher. 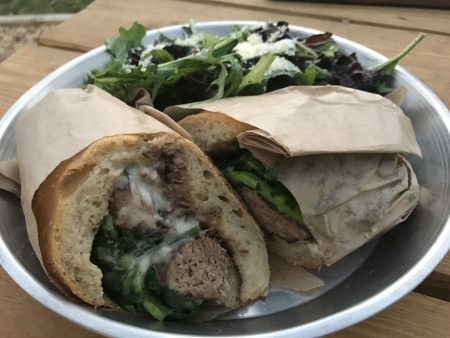 The owners also own a restaurant in Portland, but felt it was time to bring their concept back to Jacksonville where they are from. All these ideas work. We fully support farm to table, locally sourced, freshly prepared foods. We fully support sharing sized meals because we believe dining is a communal practice. What we experienced though on two visits was enough to convince us that while an idea can be great, the implementation is key. And due to that we will not be rushing back to The Bread & Board. On visit one, myself and two of my friends–one of which is also a food blogger–walked to The Bread & Board from my nearby apartment. The outside of the restaurant has been turned into an outdoor dining area with a wooden pergola that I hope is unfinished because the unstained wood and roofless construction left us wondering about it’s purpose. There is grass meant to picnic on with communal blankets provided in buckets outside. The restaurant is semi-open air so we walked straight into the counter service ordering area. The menu is above the counter and below it is a deli case of sides to add to your meal (which we later found out we could upgrade our Board sides to, but found out too late). Most items are available as a sandwich or a board with a few specialty items designated as entrees. I ordered first and after finding out the Lemongrass Ribs ($14) were sold out, opted to order a Muffaletta Board ($14), the standard House Meat Board ($10) , and a glass of wine ($9). My friends ordered the Braised Beef and Gorgonzola Board ($13.50) , the standard Cheese Board ($11), and the Dessert Board ($12) and two sodas. We opted out of sandwiches because as I walked through the restaurant to the counter I noticed they were wrapped, and we wanted to share everything. It wasn’t particularly busy, there were scattered tables filled without any large parties. I turned around with my water glass and searched for the drink station (some direction from staff would have been nice). The drink station was out of ice. I then searched for silverware for myself and my friends and went to sit at the table, assuming napkins would be there because there weren’t any on the bar. There weren’t, but the owner / manager swung by with some a few minutes later after realizing the bar had been out and handed us each one. This is another minor opening issue, but ensuring things are stocked should be the job of dedicated floor staff and it added to the confusion of the experience. Our first board, the Muffaletta Board, came out fairly quickly and was followed by the House Meat Board and House Cheese Board. Our Dessert Board came out and we told the manager/owner (? we aren’t sure, but he appeared managerial) that we were missing a savory board. He brought it out immediately and said it had been overlooked in the kitchen (opening issue, these things happen but hopefully it hadn’t been overlooked for too long). Here’s where my conceptual issues come into play with this restaurant. The Boards have been described in all the interviews with the owners as “deconstructed sandwiches.” In hindsight, I’m really having trouble wrapping my head around how we have gotten here as a society. My friends and I paid $75 for a counter service meal for three people and we spent that to put together our own sandwiches. Had these Boards been full of exotic meats and cheeses, varying interesting breads, and unique condiments and pickled things I would be excited. But these Boards were unremarkable and honestly, indistinguishable from the deli at Publix. And I mean the Publix branded meats, not Boar’s Head. Here’s a breakdown of our boards. 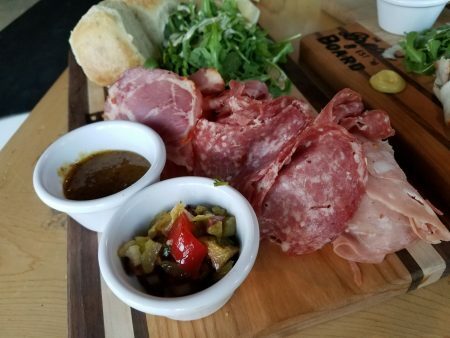 Cured Meat Muffaletta Board: The best of the meat selection by leaps and bounds, but still no difference in taste or texture than any other hard cured meats you’ve eaten in your life. Five small cubes of provolone accompanied the meat alongside a dish of pickled olive tapenade (loosely tapenade, this was rough chopped and too large to try to squish into a roll) and a sweet sauce that did not belong on a Muffaletta and paired poorly with the cured meats. Cost wise, this was the most bang for your buck on quantity of meat. We finished the meats on this Board and as I said, they were by far the best tasting, but still not any different than any other I’ve had at any price point. The board came with two of their signature rosemary focaccia rolls which were good, however I wish there would have been a different bread option for these meats. 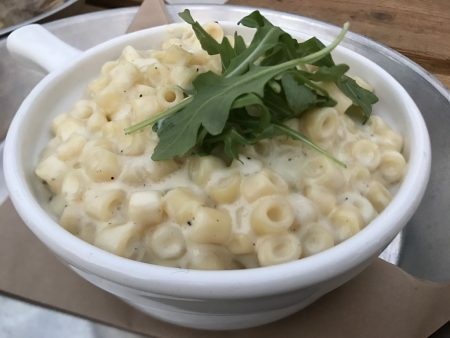 It also comes with a pile of arugula with roughly a teaspoon of a citrusy dressing. It looked much like an afterthought and a space filler. Braised Beef and Gorgonzola Board: Nope. On trip one, we ordered this as a Board. On trip two, we ordered this as a sandwich. Nope on both counts. Imagine if you took a cheap cut of beef and cooked it on high without enough liquid in a crockpot for four hours instead of on low for eight hours. That is the beef texture and flavor presented. It’s tough, stringy, and flavorless on all counts. 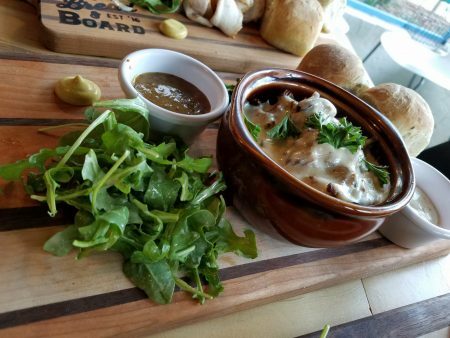 The Board offers it in a cup with gorgonzola cheese fondue on top. That saved the dehydrated beef at the top of the cup but abandoned the bottom to it’s fate. The surprisingly flavorless gorgonzola didn’t offer much in the sandwich setting either. Gorgonzola has a kick to it and is fairly distinctive so I’m not sure what happened here. This board came with the same sweet sauce as the Muffaletta Board (also unsure of it’s purpose with this particular meat and cheese combo) BUT also with an amazing spicy mustard that I’d love on everything. Unfortunately, you get exactly one dime sized drop and nothing more. We scraped it off the Board to put on our other meats. We’d love that mustard on the Muffaletta Board as a perfectly paired condiment. Two more rosemary foccacia rolls and another pile of uninspiring arugula finished this Board off. 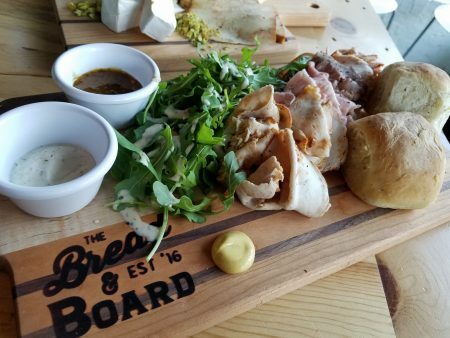 House Meat Board: This Board consists of three meats that they call “Cherry Wood Smoked Ham, Sweet Tea Turkey, Low n Slow Beef”. In actuality, it tastes exactly like a slightly oily Oscar Meyer deli ham, the cracked pepper Oscar Meyer deli turkey, and more of the dry shredded beef that is just not enjoyable in any way. It’s accompanied by more of the sweet sauce, another pile of arugula, the rosemary focaccia rolls, and aioli. I’m beginning to feel for the small farm that we robbed of arugula at this point. 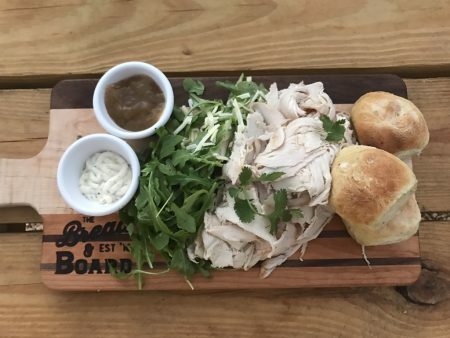 On visit 2, we ordered the Sweet Tea Turkey as a Board as well, and it simply doesn’t taste sweet, not a bit. I’m not sure what is getting lost in translation here but for it to be a signature item it needs a lot of improvement. This Board was saved with another dime sized drop of the amazing spicy mustard. If you’ve had any type of deli meat ever, regardless of quality, you will find a remarkable familiarity in the ham and turkey here. If you’re looking for something unique and exciting, this is not the Board to order. 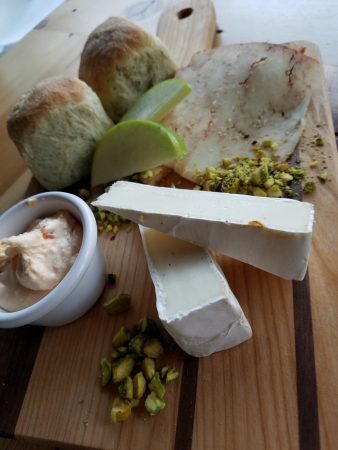 House Cheese Board: Good news cheese fans: our House Cheese Board was fantastic. Bad news cheese fans: it varies every day and the featured cheeses aren’t listed on a menu board. Mid meal, I checked in with another food blogger I know and he said he did not like two of the cheeses on his Board a few days prior. By this time my friends and I are face first in the cheeses on ours because we were so excited to find something delicious. That’s when we realized the cheeses rotate. It would truly help the consumer if a small chalkboard was placed on top of the deli counter with “Featured Cheeses” to avoid this going forward. Had we talked to our friend prior, we may not have ordered the Cheese Board. It turned out to be the highlight of our meal. We had a super creamy brie that was sliced into two large wedges, a spicy tangy cheese of some sort that appeared to be sliced meat but turned out to be a hard cheese (sorry no name, there was no indication we saw anywhere of listed cheeses), and the creamiest pimento whipped heavenly cheese that has ever existed. This was accompanied by crushed and whole pistachios and tangy green apples and paired with two more rosemary focaccia rolls. It was presented elegantly and was absolutely worth every penny. As a stand alone item, this would have kept me coming back once a week just to enjoy this Cheese Board. Unfortunately, I can’t guide you as to whether this will be your experience. Dessert Board: Sliced strawberries brightened up our Board that consisted of a brownie wedge, a mini creme brulee, a lemon sugar cookie, and a chocolate chip cookie. We dug into the brownie wedge first and it was rich, delicious, and dense. Chocolate lovers will love this one for sure, however don’t get too attached, as desserts rotate daily as well (sorry readers). The creme brulee was pretty average. The menu online describes it as rhubarb. If it was in this instance it totally fell flat as it seemed like a standard creme brulee. It wasn’t bad, it just doesn’t hold up to any I’ve had recently. The lemon sugar cookie we had on trip 1 and trip 2 and both times it was superb. The chocolate chip cookie turned the tides though. We broke off bites to share and all quickly started pulling pieces of herbs out of our mouths that were baked into the cookies. I have no idea what it was, but I can tell you it does not belong in a chocolate chip cookie–at least in that quantity. It was overpowering and honestly a little alarming to have a mouth full of herbs when you’re expecting a mouth full of chocolate chips. As someone with food allergies, it’s also a little scary to find a hidden ingredient like that without warning. 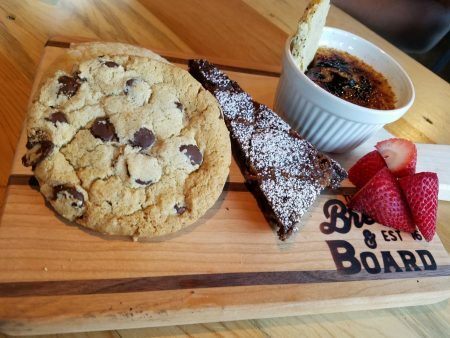 A Dessert Board of the day listing on a menu board with descriptions would also be a great guide for guests. After a few social media posts, we found out through a response from the owner that you can request more rolls if you want beyond the two on the board, but I’m not sure how many of these you’d actually want. I’d prefer a variety of breads like what is listed on the menu for sandwiches instead. On visit 2 the Acini de Pepe (think fancy mac & cheese) was oversaturated with red pepper. If you love red pepper you might love this dish. But for us it just killed the dish. Maybe there are some hidden gems on this menu, but we haven’t found them, and we aren’t really willing to explore much further. The manager / owner, via social media also offered to speak with us regarding our experience. We opted to go in a second time to see if the experience was linear before we published this article. It was, so at this point we will go forth with publishing our honest thoughts. I feel like we have fallen victim to accepting all the trends with deconstructed things and are drawn in by the locally sourced and house-made catchphrases paired with picnic blankets and pergolas. At the end of the day though, would we rather spend $75 on uninspiring deli meat boards or enjoy Happy Hour at Orsay? I think that decision is clear. Tagged Alcohol Serving, Beer (Breweries and Restaurants), Casual, casual ambience, Dessert, Dinner, kid friendly, lunch, outdoor seating, sandwiches. Bookmark the permalink. I agree we weren’t impressed either! Very poorly organized.waited a long time and they weren’t busy.. the poor girl taking orders acted like. she didn’t want to be there too. Probably won’t go back.